Today’s choice is yet another compromise play – sounds trendy, but has impeccable roots. Thanks to Emmy Jo for suggesting our Name of the Day: Javan. Ask about Javan on a baby naming board and odds are that at least a dozen people will dismiss him as invented. Odds are that some parents arrive at this choice by mixing up the ever-popular letter J with Kevin and Devon. But Javan has a story of his own, and it is quite ancient. In the Bible, Noah built the arc, saving not only all of those furry animals, but his own family, too. His son Japheth is considered the ancestor of all European peoples. (Brothers Ham and Shem populated other corners of the globe.) Japheth’s seven boys, in turn, fathered the tribes of Europe – the Iberians, the Basques, the Scythians, the Slavs and so on. Despite his history, Javan has never been a common choice. He does appear in census records from the late nineteenth century onward, but quite sparingly. In addition, Javin Hunter played football for Notre Dame and the Baltimore Ravens. While the Biblical Javan is probably best pronounced jah VON, the common sound for many of the related choices is either JAY vahn, jay VEE on or something similar. Some parents might arrive at Javan courtesy of Katherine Kurtz, the fantasy author. Her character Javan Jashan Urien Haldane is the fourteenth King of Gwynedd. While Kurtz’ work is pure fiction, she’s well versed in all things medieval. 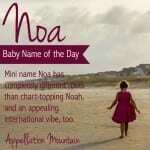 Visit her official site and you’ll find a list of parents choosing baby names from her books. Sure enough, there’s a Javan. Javan also tends to pop up on lists of angels’ names. (I’m not well-versed in angelology – if any one is, please feel free to add some details in a comment!) In the Book of Daniel, there is a reference to the prince of Javan, but that’s usually interpreted as a reference to Alexander the Great, King of Macedon – or Greece. Most agree that the prophecy comes from the angel Gabriel. In the Talmud, too, Javan is definitely associated with Greece. On balance, there is certainly room to consider Javan – and perhaps even Javon and other variants – an underused Biblical choice. And, like Eben, he could satisfy parents divided between the traditional and the modern. But you’d have to be comfortable with the likelihood that few would recognize Javan’s roots. I briefly considered Javan when I was going through my underused biblical names craze, but tossed it out of the fear that my kid will blend in with the “two syllable, ends in n” crowd. jah VON is how I say it too–another reason I chucked it; I knew it would probably be misprounounced. However, if the “two syllable, ends in n” craze is over by the time I have kids, perhaps I’d be willing to reconsider it then. Funny, Lola, Alaric seems to be one of the more popular names Kurtz has inspired! I quite like it – I grew up with an Aric. Emmy Jo, I do say tah MAR and sah RYE. But I can’t say for sure where I picked up their pronunciations. I do know a Tamar who says it that way – I’ve never met a Sarai. Most name sites strongly favor JAY vin, and from the Jayvon/Jayvin spellings, I’d guess that’s the dominant one in use. But a few also list jah VON and while I’m not great with Hebrew, it strikes me that the Hebrew version of the name – Yavan – calls for emphasis on the second syllable. Or am I just thinking of Yahweh, which isn’t exactly an ordinary word? Here’s the link to the Strong’s Concordance Hebrew guide: http://www.sacrednamebible.com/kjvstrongs/STRHEB31.htm But they don’t list anything under Javan, only Yavan. Sharmila, I love Jovan! I think it is a variation of John – and a rather dashing one! Javan’s not my cup of tuna but I can respect his literary/historical link. Kurtz’s Deryni series has long been a favorite; Alaric Morgan and his cousin Duncan are two of my favorites of all time (and how Alaric ended up on my lists in the first place!) If I ran into one, I’d recognise a fellow Fantasy freak/History buff and probably end up witha new friend. 🙂 I don’t mind Javan at all. I’ve always thought jah-VON when I ‘ve seen this too. because the only other pronunciation that occurred to me Jah-van, sounds awful in my head! He may feel trendy but will stand the test of time much better! I know a Jovan- he’s Serbian (I don’t know if that variant is necessarily Serbian or not, though). It’s pronounced Jo-VAUGHN, and that was actually the way I would have pronounced Javan as well despite the -a. Although he’s not to my personal taste, I understand his appeal. Interesting one! I have respect for Javan. It’s not one I’d consider for me, but it’s one I’ll suggest to parents on Yahoo Answers who seem to want the feel of a made up name.